If you follow my blog but don’t know me personally or follow my writing at other sites then I must begin by saying that we lost another son, Samuel Isaac*, at 17 weeks gestation last month. We had been told that our loss of Charlie was almost certainly just bad luck. Just the 1 in 4 pregnancies that ends in miscarriage. We mourned our son but were excited to be expecting again 6 months later. Excited but terrified. No amount of reassurance could convince me it would be okay. And then it wasn’t. Two late term losses are very rare and the boys both died from lack of blood flow but with no obvious cause. We now know something is very wrong, and after extensive testing most of the standard avenues have been exhausted with no answer as to what, or whether it can be fixed. I have no idea what to do. That sentence is also my worst nightmare. I am a planner and a dreamer. I struggle mightily with this sense of powerlessness but I am beginning to see that the solution is to submit to it, accept it, and even learn to enjoy it. When Charlie died, Dulcie was still an infant. She needed to sleep in a crib, have her diaper changed, and she couldn’t talk. At night when I was aching to hold my little boy she let me rock her to sleep in the dim nursery room and feel like I still had a baby. The week Samuel died, she decided on her own to potty train. She talks, she sleeps in the “big kid” room, she puts on her own shoes and sits outside on the porch petting the cat while I watch through the window. There are no babies in our home for the first time since JD was born 8 years ago. Where Dulcie was once my therapy baby with her snuggles, she is now my therapy toddler. It’s a slightly more aggressive form of therapy but very effective. “Get up Mum! Come! You play me!” Ok I guess I better get up and play then. I even had to interrupt this writing to go play dragons and then babies and then run back in to write a sentence before building a block castle and digging out coloring books. Every second that I am not actively teaching school to the three older children the family tyrant is demanding I drop everything and spend time with her. The thing is, I can usually drop what I’m doing now. Dishes always wait for you. Laundry can hold off another few minutes. I’ve been pregnant or breastfeeding or otherwise caring for an infant for basically my entire marriage. A nursing infant needs you right now. A big pregnant belly gets in the way of crawling around playing Come Here Kitty. But those distractions and obligations aren’t on my to do list anymore. 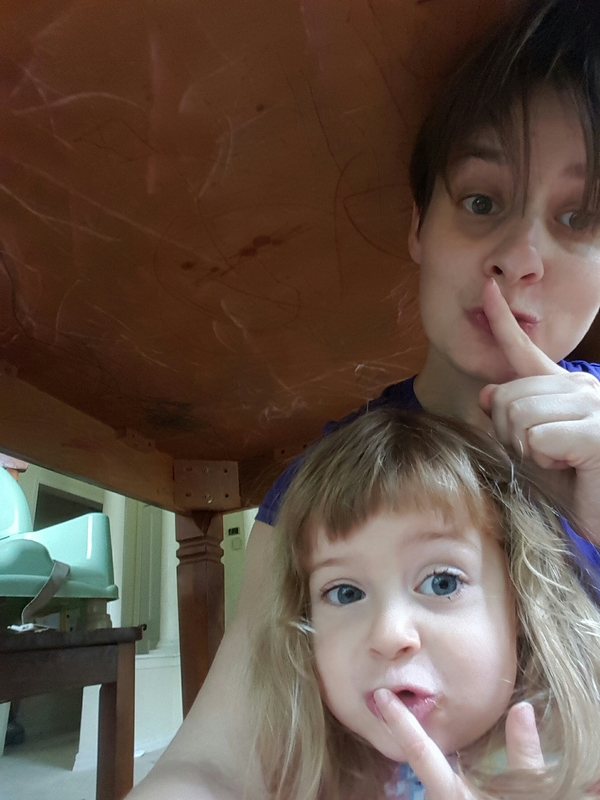 So yesterday when I had to “quick hide dheres a monster comin!” we dove under the dining room table. 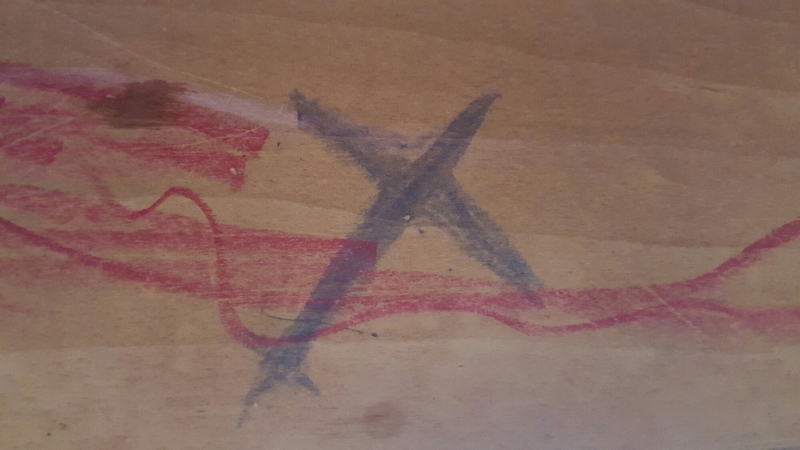 This table is on its last legs. (pun unintended but enjoyed.) Its beautiful hardwood maple replacement is being handcrafted by my husband as we speak. It is a small Kmart table we bought when we were first married. 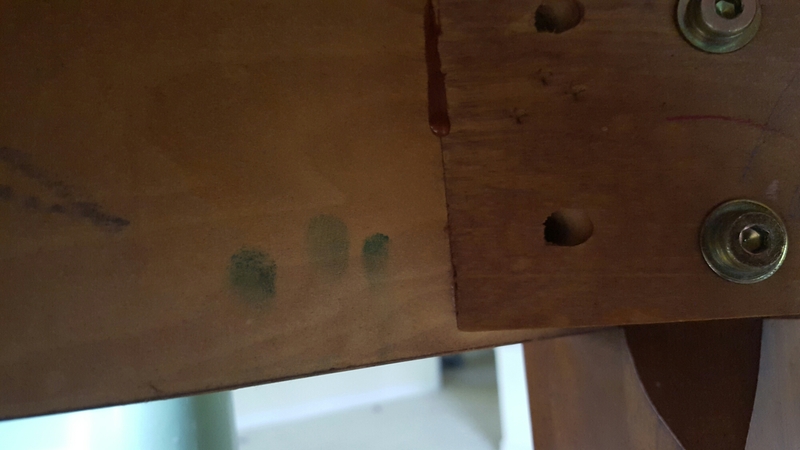 The chairs have slowly disintegrated, the faux wood finish is rubbed off. So if this incident had happened in a month or so I would have missed what I found yesterday. I imagine it must be like what an explorer feels when they stumble upon cave art. 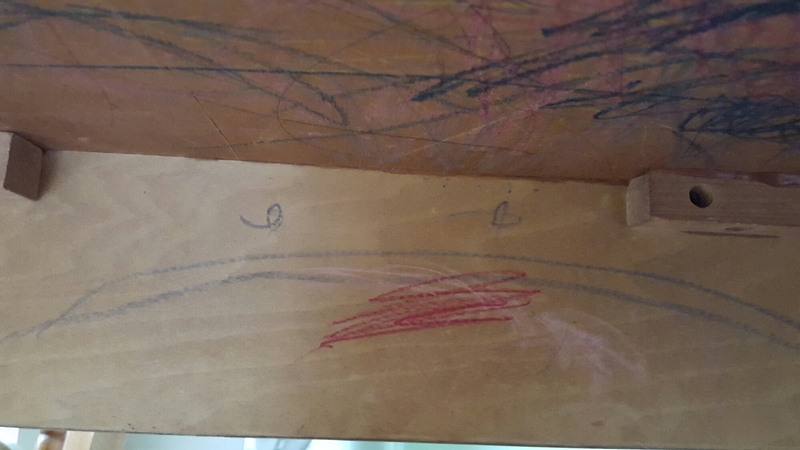 Because under the table I found at least 5 years worth of doodles done by my children. Mostly it’s just a big mural of scrawling. And my personal favourite, these inky fingerprints. 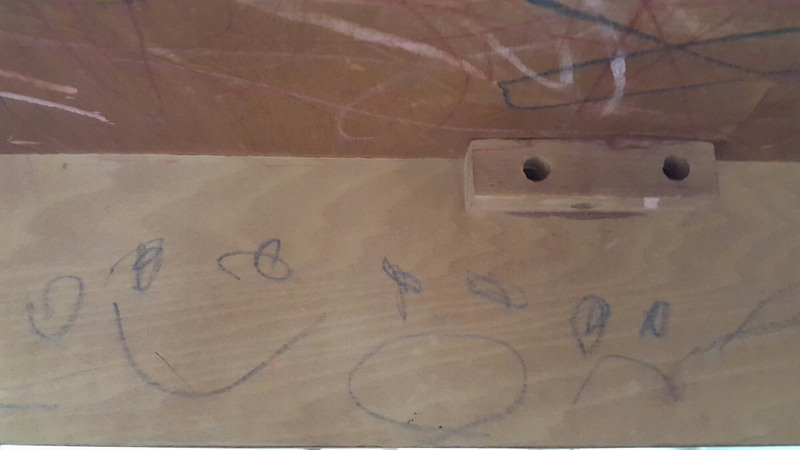 It is the record of four children all going through the scrawl-on-every-surface phase when they are small enough to leave their mark in this secret place. And I’d never seen it. Now I know I didn’t somehow neglect my older children by having their siblings. We spend every day together talking and playing and eating and cleaning and just living. I hope and pray that one day we can have another child to add to the inseparable gang. I’d give anything to be rocking Charlie, or pregnant with Samuel, but I am finding goodness, joy, and reason in how life looks right now. I wish I was too busy nursing or too fat with pregnancy to fit under this ugly old table. 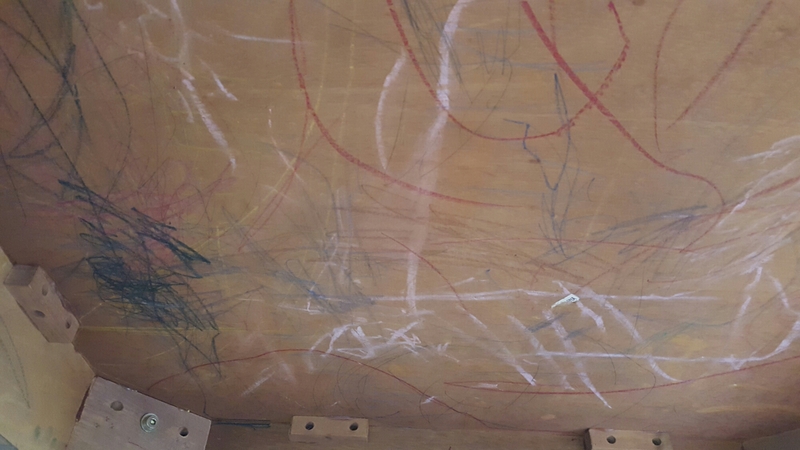 I can choose to dwell on that though, or I can lie on my back and stare up at five years of childish scribbling and be grateful I got to see it. I can be grateful for a chance to really soak in playing with a toddler uninterrupted (a toddler we now know we are very lucky to have as the doctors believe her tiny size at birth was the first sign of something going wrong). I can enjoy playing cribbage on bed rest with a very clever and compassionate 7 year old nurse, or running errands with the most wacky and imaginative 6 year old in the world or doing my nails with the princess 4 year old (I’M NOT A PRINCESS MUM I’M A QUEEEEEN). 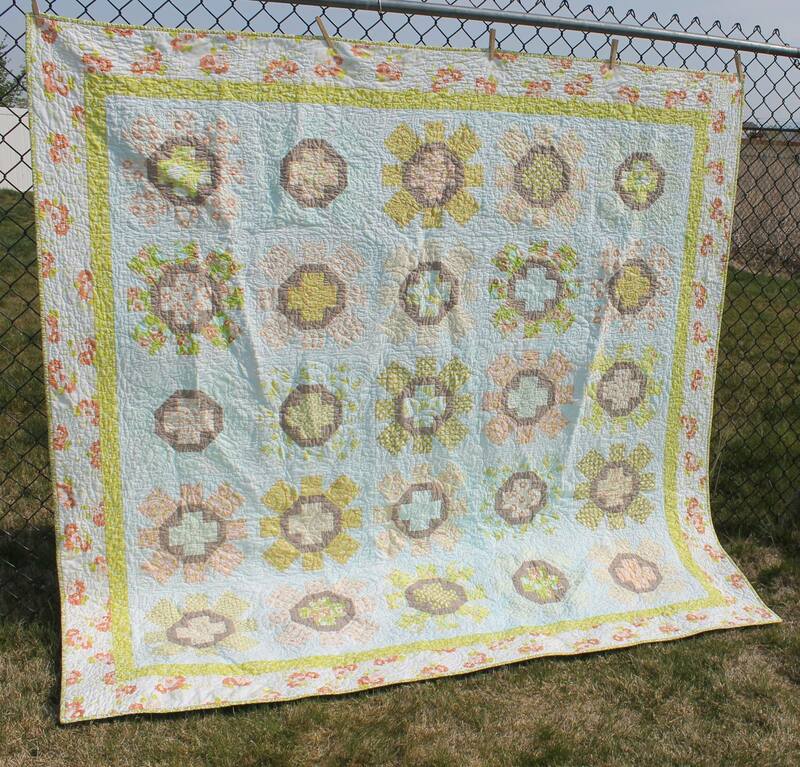 A friend of mine sent me this quilt a few months ago. She had “ruined” it in a laundry accident the same week Charlie died. Sorry I never sent your thank you note, Kate. I meant to but I was waiting to be able to tell you we were having another baby and I never quite got up the nerve to write it down until it was too late and we weren’t anymore. Kate sent the quilt to me with a note to remember that sometimes things don’t turn out the way you pictured but they can still be beautiful. 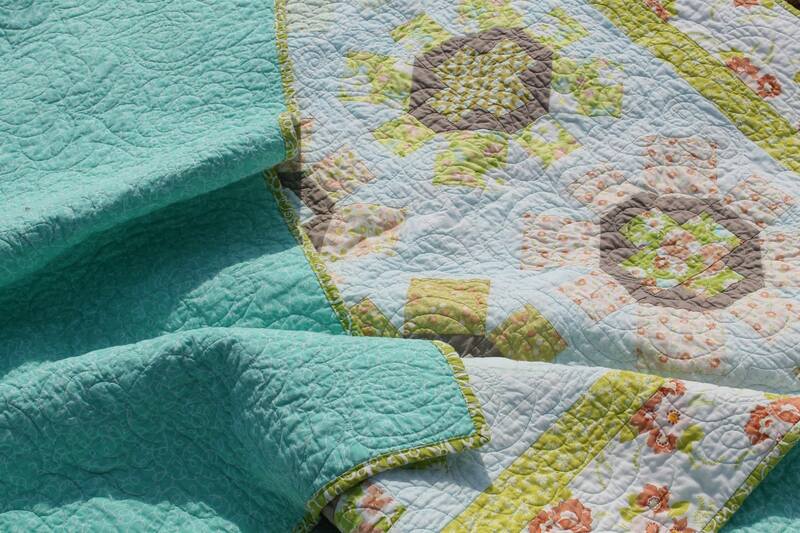 This quilt has gone on picnics and berry picking. It has been another great hiding place from ghosts and monsters. It has played peekaboo and rolled kiddies into burritos. It has also gone with me to the hospital and comforted me with its weight and warmth and the reminder of its message as we held our second lost child. It’s seen a lot of life and it will see lots more. This isn’t how we pictured things but it’s beautiful too. We have a meeting with specialists in October to try and find some answers, but all the doctors involved have admitted they’re pretty much stumped at this point. There are glimmers of hope but not enough information to plan with. So right now we exist in a sort of limbo. There are no decisions to be made, nothing to be done except live every day. We have, for the first time in either of our lives, absolutely no five year plan. No vision of the future. It could look like anything. I have no clue where to go from here. So I’ll live really fully here for now. Here is a pretty marvellous place, even hiding under the old dining room table. *Charles Donald was named for my Dad and for a priest who shaped my life and whose intercession I asked for through the crisis. For an explanation of Samuel Isaac’s name here is what I wrote shortly after he died while waiting to deliver him. Life can mean a heart beat and brain activity, and Life can mean sanctifying grace. Somewhere between, where these two mingle in the wondrous creature Man, is another meaning of the word. Life as it is lived in all its complexity day to day. To be pro-life is to be for all three of these. And it is this middle kind of life that I think mothers are particularly suited to champion. I will call this union of biological life and spiritual life the Life of Joy. Children possess this life in a special way because of their innocence and energy. We are the caretakers of little living vessels of sanctifying grace. Warm soft breathing bodies filled with God’s grace. To be generous and open to life does not only mean to welcome these fabulous beings when they are knit in our wombs. It means to generously share each of them as a gift not just to us but to the world. I have said before that a homemaker is a joymaker. We are also caretakers of the glowing embers of joy that are our children, and the world needs their warmth. So share your children. Share your children by taking them to Mass, even though they may squirm in the pews. Jesus said, “Let the children come to me, and do not hinder them.” Share your children by being proud to bring them with you in public. Share your children by accepting the help of strangers even when it is actually inconvenient. They are being called by your children’s joy, trying to draw close to it, nourish it, and keep a part of it. Even if it means you feel the need to secretly douse your kids with Purell when you get to the car, share your children by letting the lonely grandmother feel the grip of their chubby dimpled fingers or the velvety softness of their cheek. Share your children by accepting graciously all compliments about them, however tired and trite. Share your children by asking for help when you do need it! Your pride may be humbled but you are offering someone an opportunity to be a caretaker of joy too. And yes, share your children with those who scowl at them, and those who mutter about them. Do not let them discourage you or force you to hide your children away from the community, ashamed that they are an inconvenience to others. Who needs joy more than such miserable people? Be pro-life, from conception to natural end. Live the part in between with the same joy we hope for in the life to come. Become like children.